Located in Williams, Arizona, the Grand Canyon Railway Hotel (800-843-8724, www.thetrain.com) is a great place to stay before or after a scenic train ride to the South Rim of the Grand Canyon. 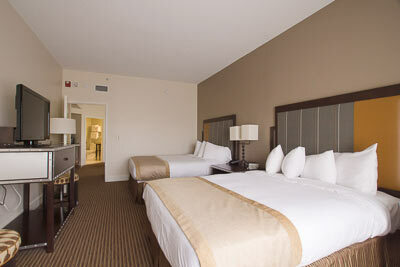 And with a recent $400,000 renovation to the property, it’s now more comfortable than ever. Access hasn’t been overlooked either, as two of the ten refurbished suites are wheelchair-accessible. 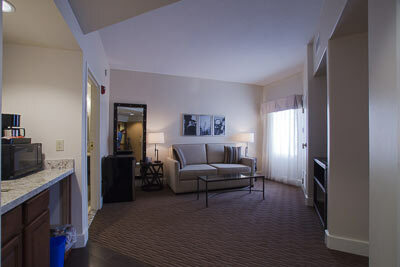 Suite 1326, which is located on the ground floor, is the most accessible suite. It features wide doorways, a lowered peephole and good pathway access to all areas of the room. It’s equipped with a kitchenette with a refrigerator, a microwave and a wet bar; and a sitting area with a sleeper-sofa, coffee table and a flat screen TV. The sofa can sleep two people, and when it’s unfolded the bed is 14-inches high. The spacious guest bedroom features two 27-inch high queen-sized beds, with a wheelchair accessible pathway between them. There’s plenty of room to navigate a wheelchair in the room, which is also furnished with a desk with a chair, night tables, an easy chair and an armoire with a flat-screen TV. The environmental controls are wheelchair height, and the draperies feature easy-to-reach wands for opening and closing. 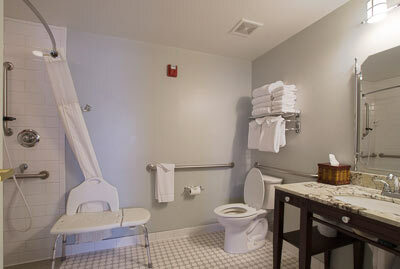 The bathroom is equipped with a roll-in shower with a hand-held showerhead, grab bars and an adjustable shower chair. Other access features include toilet grab bars on the right and back walls (as seated), and a roll-under sink. Access to the public areas, including the bar, restaurant and the pool is also good. The pool and spa are equipped with lifts, and there’s plenty of room to roll around on the level deck. Out front, there’s plenty of accessible parking, with level access to the front desk, and an accessible pathway to the train depot in back. Customer service is top-drawer at the Grand Canyon Railway Hotel too, so don’t be afraid to ask if you need anything. And if you’d like to take an excursion on the Grand Canyon Railway, you’ll be happy to know there’s also lift access to the train. The bottom line is, the Grand Canyon Railway Hotel is a very comfortable, accessible and friendly place to stay; whether you’re just passing through or lingering on to explore the magnificent Grand Canyon.